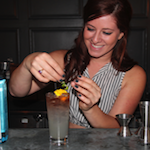 A close look at this hot spot’s new drink list. The new cocktail menu debuts tomorrow, while the new beers will show up in a couple weeks. Here’s a look at the her new list along with her notes. “Lilly of the Valley”: Bombay Sapphire gin, agave, Chareau aloe liqueur, soda, float of rose. This is the cocktail that Karen did for a recent Bombay Sapphire competition where she was one of the top 10 finalists. But she’s considering switching up the gin for vodka for the menu. Caipeira: “It’s a pear Caipirinha with Leblon Cachaca, pear brandy, cane sugar and lime with a little bit of Peychauds so it’s going to be an interesting twist on a fall Caipirinha.” It was inspired by one of the Churchill bartenders who is from Brazil. The Churchill, 8384 W. 3rd St., Beverly Grove, 323-655-8384.